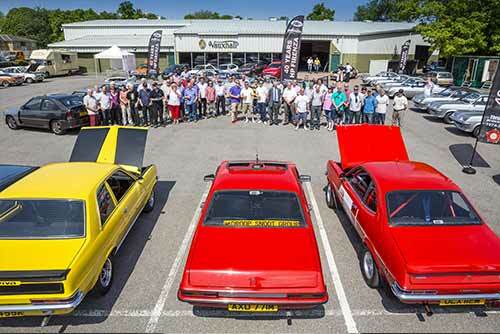 The Droop Snoot Group celebrated the Vauxhall Firenza Droop Snoot’s 40th anniversary at Vauxhall Motor’s Heritage Centre in Luton and Millbrook last week. 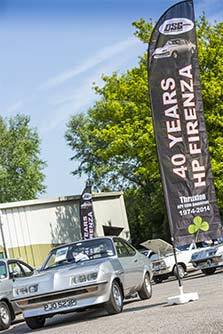 The Club gathered at Vauxhall headquarters, displaying 40 of their cars and celebrated the legacy of the iconic Firenza Droop Snoot. ‘Old Nail’, the car used in British saloon racing by Gerry Marshall in the 1970s, was displayed alongside a selection of 13 recently restored Firenzas. The second day of the event involved a selection of the cars being driven to Millbrook Proving Ground in Bedfordshire to be driven around the Speed Bowl and Hill Route. The Firenza HP, first manufactured in 1973, was nicknamed the ‘Droop Snoot’ due to its distinctive, concorde-like sloping nose. Manufactured at Ellesmere Port, the HP marked many landmarks for Vauxhall, including its return to sport and being its first model to crack 10 seconds from 0-60mph.